The U.S. passport is the gold standard of passports, or so I used to believe. In 2007 my friends and I were supposed to go to Brazil for New Years only yours truly was unaware of the visa entry requirement forcing us to cancel the trip just two day before departing. Back then the word visa conjured up memories of my parents immigrating to the United States. So why as an American would I ever require this document just to go on vacation? The answer is reciprocity and politics; The US government forces visitors to have one so they, in turn, require Americans to have one as well. Fair enough, that’s not the point of this post. The point is since the Brazil debacle, I have always checked and rechecked the entry requirements for every country because I do not want to ever experience that sick feeling from 2007. But, even with my due diligence, I still encounter trouble and inconvenience. Sudan isn’t the safest place in the world right now and they do require a visa for tourists wanting to visit. I did not, I was simply passing through. My flight landed in Khartoum late in the evening with plenty of time to make my next connection. At the Customs entrance, I was asked for my visa and I replied with the magical word in transit and they again asked for a visa. Again, I said in transit and back and forth this game went till I was told to step out of line. They sat me down in a waiting area and asked for my passport. I hesitantly handed it to them and watched them walk away with my freedom. Moments later a few officials came back in my vicinity and started speaking about me in a foreign language. Luckily for me and unbeknownst to they were speaking in a language I understood- Arabic. Rough translation: “This American doesn’t have a visa!” Meanwhile, I sat there in ignorance pretending I had no idea what was going on. “Where is your ticket to leave Sudan,” they questioned in English as I checked my watch to see how much time I had left till I missed my connection. Puzzled, the group huddled up and kept carrying on in Arabic about “Amreeki” and “no papers”. Finally, they said come with me and escorted me back out the door from which I had arrived onto the tarmac. A little nervous, I followed the armed guard to another gate where passengers were waiting to board their flight. From there I felt like a video on rewind as I went backwards through the security checkpoint, through the terminal, and out to the entrance of the airport. At last, I had made it into Sudan! Wait, I don’t want to be in Sudan, I’m in transit! The officer told me to wait as he went to the ticket counter. More discussion, more argument, but I finally was given a ticket to get out of there. On a side note, Khartoum’s airport is terrible. Ticket in hand, still ample amount of time, I started to make my way to my gate. I approached the Customs desk and handed him my passport (luckily retrieved) and my boarding pass. In transit! I said as calm as I could. Unconvinced, he asked for his supervisor. More discussion, more argument, and I was finally allowed to pass by. The next stop was the metal detectors and security screening. Surprisingly or unsurprisingly, there was no fuss at this final checkpoint. 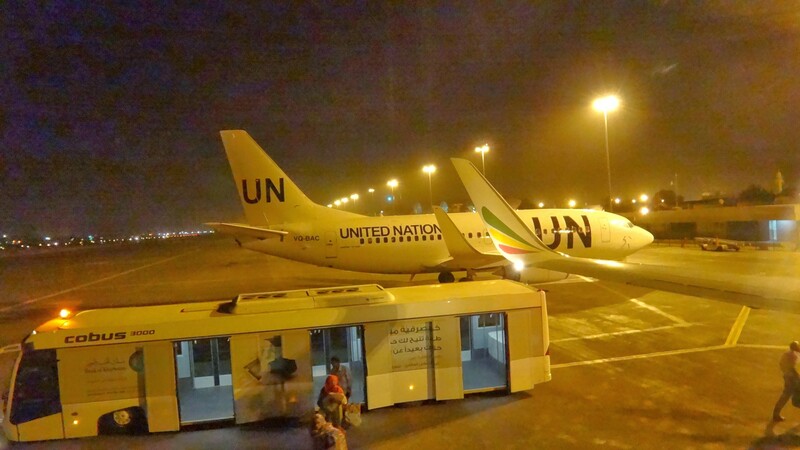 At the gate, with moments to spare, I sat there, eager to leave Sudan. 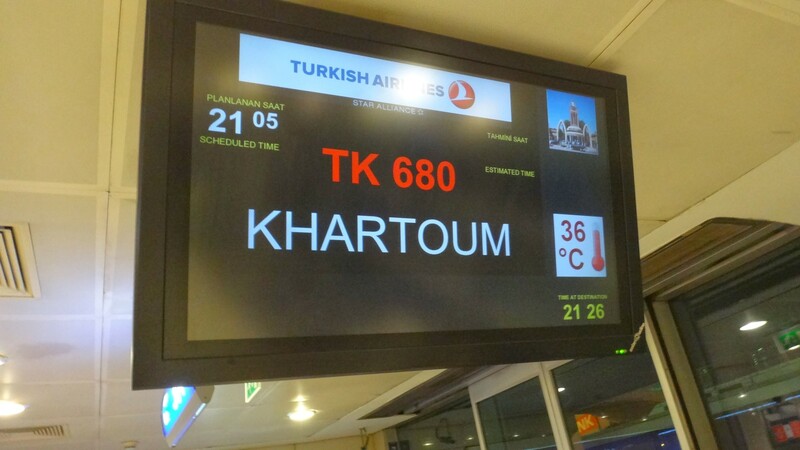 My row was called and I headed to door, my eyes set on the plane that would get me out of Khartoum. The scene from Argo flashed through my mind as I was steps away from the plane. I’m in t-r-a . . .
A blogger trying to take advantage of an already very generous visa free rule…color me surprised.